Two tankers with liquefied natural gas and a planeload of blankets may be what it takes to start easing Russian-Japanese hostilities over a 65-year island dispute. Prime Minister Vladimir Putin ordered extra energy shipments for Japan and the Emergency Situations Ministry prepared a plane with humanitarian aid after a powerful 9.0-magnitude earthquake rocked the island nation Friday at 8:46 a.m. Moscow time, provoking a tsunami, an explosion at a nuclear power plant and as many as 10,000 deaths in one region alone. Japanese Prime Minister Naoto Kan said Sunday that the country was facing its most serious challenge since World War II. "This is the toughest crisis in Japan's 65 years of postwar history," Kan said in televised remarks. "I'm convinced that we can overcome the crisis." Japan asked Russia to increase energy supplies after the nuclear power station Fukushima Daiichi north of Tokyo was damaged by the massive earthquake, and Moscow is ready to help, Deputy Prime Minister Igor Sechin told Putin at a meeting Saturday. "Japan is our neighbor, our friendly neighbor, and despite various problems we have to be reliable partners," Putin said in remarks shown on state television. Putin asked state-owned gas monopoly Gazprom to consider increasing shipments of liquefied natural gas, or LNG, to Japan, where 30 percent of electricity is provided through nuclear energy and which is the world's biggest LNG buyer with 59.5 million cubic meters a day. "We are looking for ways to divert two tankers that are en route under other contracts toward Japan for supplies in April and May," Sechin told Putin. "They are two 100,000-metric-ton vessels." On Sunday morning, a Sakhalin-2 tanker with 19,500 cubic meters of LNG left Sakhalin island for Hiroshima, where it will dock Tuesday. Another tanker with 100,000 cubic meters of LNG will leave for Japan on Monday, Interfax reported. But both tankers will be delivering LNG under existing contracts, the report said, meaning that no tankers have yet been diverted and that the additional shipments as per Putin's instructions have not begun. In addition to LNG shipments, Mechel and SUEK will consider boosting coal supplies by 3 million to 4 million tons, Sechin said. Japan also accepted Russia's offer for humanitarian aid on Sunday after earlier welcoming similar assistance from 69 other countries. An Il-76 with about 50 people on board, three rescue vehicles and special equipment will leave shortly for Japan, where the team be able to work autonomously for two weeks, the Emergency Situations Ministry said on its web site Sunday. Russia is "ready to offer Japan all possible aid to cope with the aftermath of this tragedy," President Dmitry Medvedev said in a statement in which he offered his condolences. Ordinary people also shared Japan's grief, laying flowers outside the Japanese Embassy in Moscow. The Japanese government thanked the Russians for their support. "Russians are constantly expressing to me their condolences and showing their solidarity, which warms my heart," Masaharu Kono, Japanese ambassador to Russia, said in a statement faxed to The Moscow Times late Sunday. The Russian government also mobilized its efforts in the Far East, evacuating some 11,000 residents from coastal areas before the tsunami hit Friday, the Emergency Situations Ministry said. No injuries were reported, and most people had returned to their homes by Sunday. Tsunami warnings were also issued to 76 fishing ships in the area Friday, Itar-Tass said. When the immediate danger of the earthquake and tsunami passed, the country's top doctor, Gennady Onishchenko, offered assurances that radiation in the Far East was within the normal range and that local residents had nothing to worry about. Japanese officials also said radiation levels around the quake-damaged Fukushima Daiichi plant were close to normal Sunday. 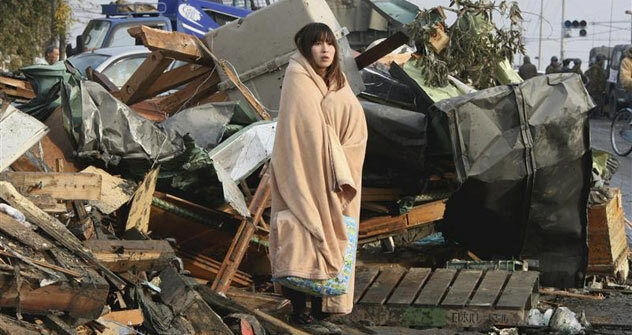 The official death toll from the quake and tsunami is 1,351, although officials warned it could soar because as many as 10,000 people are feared killed in the northeastern Miyagi region alone. Onishchenko was quick to dismiss any comparisons to the 1986 Chernobyl disaster in Ukraine that led to one of the biggest nuclear accidents in history. "The damaged reactor in Fukushima is weaker in capacity than the Chernobyl one, and even in the worst-case scenario this gives us hope," he said, Interfax reported. Onishchenko, however, expressed concern that many Japanese nuclear power plants are located along the coastline and on landfill. "After the incident, obviously, Japan will have to change its concept for developing civilian nuclear power," he said. Environmentalists said Russia itself could learn from Japan because of its interest in building floating nuclear power stations, one of which has already been launched in the quake-prone Far East. Moreover, Russia was on the brink of an incident similar to Japan’s current situation in 1993 when the energy supply to the Kola nuclear power plant in northwestern Russia got cut off because of stormy winds. "The events in Japan must become a good lesson for Russia," said Vladimir Slivyak, co-chairman of Ecodefense, an environmental group. "The lesson is the following: Nuclear power in principle cannot be safe, and new projects, like the floating nuclear power station in the Far East and grounded power stations in seismically dangerous zones only increase the risks borne by the nuclear industry." As the world's third-largest economy, Japan can deal with the aftermath of the earthquake on its own, experts believe, but given the gravity of the situation, it is best for its people that it does not. Japan's decision to reach out to Moscow and accept offered aid illustrates the humaneness of both sides despite seriously strained political ties, said Alexander Losyukov, a former Russian ambassador to Japan. "When your neighbor is in trouble like that, regardless of your political beliefs, you reach out to him and offer help," Losyukov told The Moscow Times. "I am also glad that [Japan] had wisdom enough to accept the helping hand," he said. Relations have sunk to near post-World War II lows amid a territorial dispute over four islands that the Soviet Union seized from Japan near the end of the war. The largely unpopulated islands, which suffered no damage in the quake and tsunami, are called the southern Kurils by the Russian side and the Northern Territories by the Japanese and lie as close as 10 kilometers from Japan. Tokyo, which wants the islands back, has made the resolution of the dispute a priority in recent months, but it reacted angrily when Medvedev visited the islands in November and the Russian military spoke just days ago of fortifying its presence there. While it remains to be seen whether the tragedy will lead to a mending of fences, at least one Russian politician has made an unusual proposal on how both sides could help each other in the tough, upcoming days. Vladimir Zhirinovsky, the eccentric leader of the Liberal Democratic Party who is known for his pro-Russian territorial views, suggested that displaced Japanese be moved to the sparsely populated Russian Far East. "In this case we are not dividing anything, no islands," he said in a statement on the party's web site Sunday. "We are offering [them a chance] to avoid a humanitarian catastrophe. "Let them go to the unoccupied lands, build and support themselves. They will not impede the locals, and Russia will only win if such hard-working people join us." Originally published in The Moscow Times.